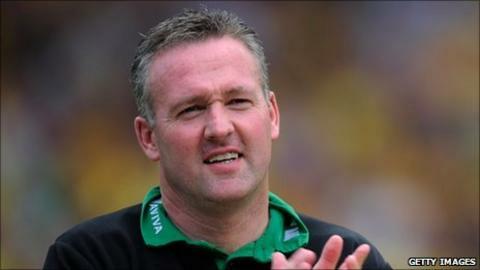 Norwich City have given their biggest hint yet that promotion-winning boss Paul Lambert is to sign a new deal. Speculation has suggested that Lambert, 41, is on West Ham's list of candidates to replace Avram Grant, following their relegation to the Championship. But Canaries deputy chairman Michael Foulger insists: "There'll be some great news for Norwich City with the manager. "There will be an announcement next week," he told BBC Radio Norfolk. Lambert arrived in Norfolk on 18 August 2009 from Colchester, just 10 days after leading the U's to a 7-1 win over the Canaries at Carrow Road. And the former Scottish international, who began his managerial career north of the border at Livingston, has since enjoyed successive promotions to lead the Canaries from bottom of League One to the top flight in the space of 21 months. He also attracted an official approach from Burnley earlier in the season, rejected by the Norwich board. "This success to me rates probably the highest in my time as a director," said Foulger. "This team has no superstars, but fantastic players and team spirit. "Those guys would run through a wall for Paul Lambert."